Need to send a suitcase? My Baggage can help! My Baggage offers a fast, reliable and affordable solution for anyone who needs to send a bag within the UK or overseas! Whether you’re going on an exotic trip abroad or a weekend break – whatever the reason may be, sometimes it can be difficult to get all of your worldly belongings into one suitcase. As a result, you may have to face excessive airline baggage fees just to bring an extra suitcase on your travels. You may even have to carry numerous heavy suitcases with you if you’re travelling by bus or train – and no one wants that. Thankfully, My Baggage offers a convenient solution – at a price you can afford. Sending a suitcase with My Baggage is simple. All you have to do is book and pay for your shipment online, and we’ll take care of the rest! You can do everything at your own convenience as we offer a fully door-to-door service for collections and deliveries within the UK and overseas. We’ll collect your suitcase and deliver it straight to where it needs to go! We’ll provide full online tracking to keep you up to date with your shipment whilst it’s in transit, as well as SMS and email notifications. We also have a dedicated customer service team ready to answer any queries you might have via phone, live chat and email. At My Baggage we understand that your top priority when sending a suitcase is to save money – and particularly if you’re going overseas, you’ll want to do all that you can to avoid extortionate airline baggage fees. Which is exactly why we make it our top priority to transport your suitcase at a price you can afford. We offer a generous weight allowance of 30kg per suitcase (which is double that of an airline allowance) for as little as £16.99! We offer super fast suitcase shipping times, with 1-2 day delivery within the UK and 3-4 days for suitcases sent internationally. We also offer an Express service both domestically and internationally, so you don’t have to be without your belongings for long. 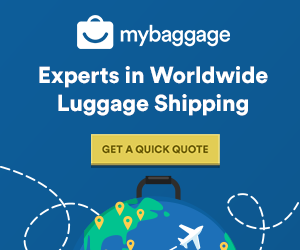 If you need to send your suitcase overseas, My Baggage can help! 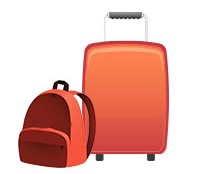 We offer an affordable alternative to sending your suitcase internationally. We offer shipping to over 200 countries worldwide at a price you can afford.